St. Louisans (from left) Bogdan Hamilton, Hossam Hassan and Daena Talavera all began fencing as young children. Look out, St. Louis – or, en garde, rather: Some of the nation’s top fencers are about to invade this baseball town. The 2018 National Championships begin Thursday at the America’s Center Convention Complex downtown. 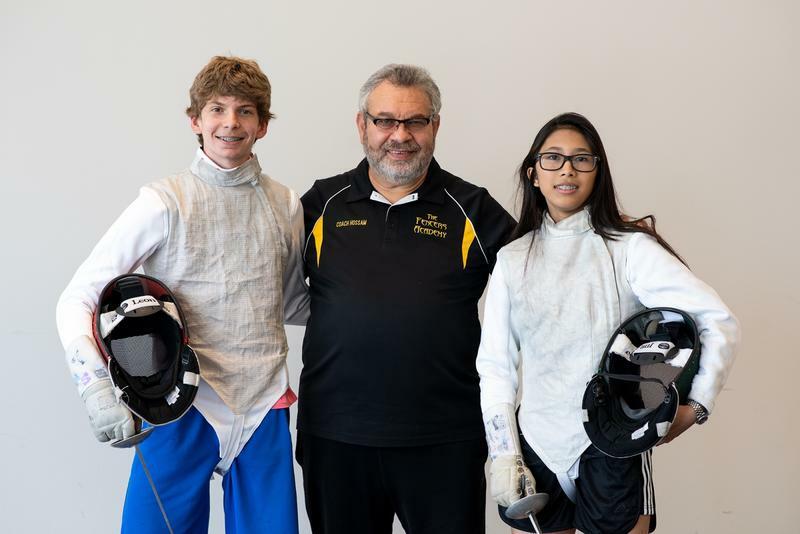 Host Don Marsh talked with Hassan and two of his students – St. Louis teenagers Daena Talavera and Bogdan Hamilton – about their love for the sport and their hopes for the major competition as it gets underway in their home city. The conversation offered listeners unfamiliar with the sport an introduction to its unique characteristics. Hassan, who competed internationally and coached Egypt’s national team for many years before moving to St. Louis in 2005, noted that fencing isn’t simply “sword fighting” as it’s popularly conceived. “We are using modern equipment [and] we teach the kids, the students, how to use these swords to touch your opponent instead of killing, like before,” Hassan said. Bogdan Hamilton (at left) and Daena Talavera temporarily turned St. Louis Public Radio’s Community Room into a fencing strip after appearing on "St. Louis on the Air." There are also three kinds of competitive fencing, each named for its particular weapon: foil, epee and saber. Talavera, 13, and Hamilton, 14, both focus on foil, where points are scored only for hits on an opponent’s torso. Both he and Talavera train at the Fencers Academy four to five days a week for several hours at a time. They also put in a lot of time pursuing other forms of physical activity. Hassan praised both students as determined, hardworking athletes and emphasized that fencing requires a lot more physical fitness than meets the eye. Coach Hossam Hassan looks on as two of his star students demonstrate fencing moves at St. Louis Public Radio. He hopes to continue to grow the sport of fencing in the St. Louis region, and the events taking place downtown include opportunities for the uninitiated to learn more about it. “We’ll have some fencing demos in Kiener Plaza [on July 3],” Hassan said, adding that the competitions taking place in the convention center are free to spectators.